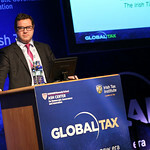 Global Tax Policy Conference opening remarks by Irish Times Economics Editor, Arthur Beesley. Feargal O’Rourke, Managing Partner, PwC, Chair for Session 1: ‘Global Tax - Whats new from the OECD, EU, US and rest of the world?’. Pascal Saint-Amans, Director, Centre for Tax Policy and Administration, OECD speaking at Session 1. Valère Moutarlier, Director, Taxation and Customs Union Directorate General, European Commission speaking at Session 1. Robert Stack, Deputy Assistant Secretary (International Tax Affairs), U.S. Department of the Treasury speaking at Session 1. Henk Koller, President, Confédération Fiscale Européennne, CFE speaking at the conference. Session Panel Discussion with Chair, Feargal O’Rourke, PwC; Henk Koller, Confédération Fiscale Européennne; Robert Stack, U.S. Department of the Treasury; Valère Moutarlier, European Commission and Pascal Saint-Amans, OECD. Session Panel: Henk Koller, Confédération Fiscale Européennne; Robert Stack, U.S. Department of the Treasury; (Chair) Feargal O’Rourke, PwC; Valère Moutarlier, European Commission and Pascal Saint-Amans, OECD. Robert Stack, Deputy Assistant Secretary (International Tax Affairs), U.S. Department of the Treasury speaking at Session 2 - Global Perspective from Departments of Treasury. Caroline Edwards, Chief Advisor, Corporate and International Tax Division, Revenue Group, The Treasury, Australia speaking at Session 2. Gary Tobin, Assistant Secretary General, Department of Finance speaking at Session 2. Session Panel: Gary Tobin, Department of Finance; Robert Stack, U.S. Department of the Treasury; Caroline Edwards, Revenue Group, The Treasury, Australia and (Chair) Brian Daly, Partner, KPMG. Session on The US tax policy agenda - the global impact - Panel during their discussion on stage; Nick Giordano, Leader, EY Washington Council; Ronald Dickel, Intel Corporation, USA; Chairman David Camp, PWC and (Chair) Kevin McLoughlin, EY. Session Panel: Nick Giordano, EY Washington Council; Ronald Dickel, Intel Corporation, USA; Chairman David Camp, PWC and (Chair) Kevin McLoughlin, EY. Session 4 Chair Prof. Jay Rosengard, Director, Ash Center for Democratic Governance and Innovation, Harvard Kennedy School, USA opening session 4 - Building infrastructure in developing and transitional economies. Chiam Yah Fang, Assistant Commissioner, Corporate Tax Division, Inland Revenue Authority of Singapore addressing the conference at Session 4. Shari Leigh Gordan, Transaction Tax Leader, EY Africa speaking at Session 4. Victoria Perry, Assistant Director, Fiscal Affairs Department and Division Chief, Tax Policy Division, International Monetary Fund speaking at Session 4. Joseph Stead, Senior Adviser Economic Justice, Christian Aid speaking at Session 4. Session Panel: Victoria Perry, International Monetary Fund; Shari Leigh Gordan, EY Africa; Chiam Yah Fang, Inland Revenue Authority of Singapore; Joseph Stead, Christian Aid and (Chair) Prof. Jay Rosengard, Harvard Kennedy School, USA. Session Chair: Lorraine Griffin, Partner and Head of Tax, Deloitte Ireland opening session 5 - The power of tax data – who owns it and who can demand it? Francesca Lagerberg, Global Leader, Tax Services, Grant Thornton UK addressing the conference at Session 5. John Connors, Group Tax Director, Vodafone Group plc speaking at Session 5 - The power of tax data – who owns it and who can demand it? Session Panel: Jan Van Trigt, Deloitte, Netherlands; Francesca Lagerberg, Grant Thornton UK; John Connors, Vodafone Group plc; Niall Cody, Office of the Revenue Commissioners, Ireland and (Chair) Lorraine Griffin, Deloitte Ireland. Sean Foley, Leader of Global Transfer Pricing Services (GTPS), KPMG, USA speaking at Session 6 - Transfer Pricing - new approaches and the transition. Catherine Harlow, Head of Transfer Pricing, RELX Group speaking at Session 6. Eamon O’Dea, Assistant Secretary, International Tax Division, Office of the Revenue Commissioners, Ireland speaking at Session 6 - Transfer Pricing - new approaches and the transition. Session Panel: Eamon O’Dea, Office of the Revenue Commissioners, Ireland; Catherine Harlow, RELX Group; Sean Foley, KPMG, USA and (Chair) Peter Vale, Grant Thornton, Ireland. 'The fiscal mix debate and sub-national fiscal challenges' Panel: Prof. Jay Rosengard, Harvard Kennedy School, USA; Astera Primanto Bhakti, Ministry of Finance of the Republic of Indonesia; Paul Johnson, IFS and (Chair) Colm Kelly, PwC. The fiscal mix debate and sub-national fiscal challenges with Session Chair Colm Kelly, Chairman, Foundation for Fiscal Studies and Vice Chairman, Global Operations Leader, PwC speaking to delegates. Astera Primanto Bhakti, Assistant to Minister of Finance, Ministry of Finance of the Republic of Indonesia. Prof. Jay Rosengard, Director, Ash Center for Democratic Governance and Innovation, Harvard Kennedy School, USA. Conference review with the Harvard Kennedy School Alumni COMTAX programme: Cora O'Brien, Irish Tax Institute; Nicolas Duboille, Granrut Avocats; Dr Emer Mulligan, NUIG; Dr Gerardine Doyle, UCD and (Chair) Prof. Jay Rosengard, Harvard Kennedy School. USA. Bill Dodwell, Tax Partner, Deloitte UK speaking the session on The impact of change on companies and countries - what next? Prof. Brian Arnold, Canadian Tax Foundation, speaking. Leon Kwong Wing, Head, Tax & Private Client Department, Withers KhattarWong LLP/TAXAND, Singapore speaking at the session on The impact of change on companies and countries - what next? Session panel: Edward Troup, HMRC; Simon Henry, Royal Dutch Shell plc, Netherlands; Leon Kwong Wing, Withers KhattarWong LLP/TAXAND, Singapore; Prof. Brian Arnold, Canadian Tax Foundation and (Chair) Bill Dodwell, Deloitte UK. Closing remarks by Prof. Jay Rosengard, Director, Ash Center for Democratic Governance and Innovation, Harvard Kennedy School, USA. Closing remarks by Martin Lambe, Chief Executive, Irish Tax Institute.